Governments embrace complexity. But innovative thinking can solve tough problems. Take India’s huge number of road accidents. They occur because India’s roads swarm with vehicles in the hands of unskilled drivers who would never get a driving licence in Europe or America. They would fail the rigorous driving test every candidate is put through in those safety-conscious societies. Here, in India, anybody can get a driving licence by greasing palms in government transport offices. 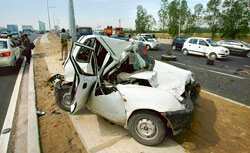 The result is that India has one of the highest road accident rates in the world. This rate will drop if the government dilutes its driving-licence monopoly and permits India’s top auto companies to issue them, too. If this were to happen, driving standards will improve because a Maruti, Tata Motors or Mahindra driving-licence authority will fail candidates with insufficient driving skills. Somebody may say privatization won’t help because the failed applicants will get a government-issued driving licence and get onto the road. True, but over time, the government-issued driving licence will be discredited by market forces. Private-sector licences will be sought for their credibility. Car, bus and taxi drivers will seek them to improve their employability. Employers will prefer a driver with a private-sector driving licence to one with a government-issued one. Even parents anxious about their children’s safety will insist that they get a private-sector driving licence before they get on the road. In a few years, the government-issued licence will lose all value. Privatizing the issue of driving licences will pose no legal obstacle. It can be done with a simple amendment of the Motor Vehicles Act. There’s no political obstacle either. If the government can privatize airlines and telecom networks, it can privatize driving-licence issue. Besides, India has no other choice. In the US, road accident deaths fell from nearly 55,000 in 1970 to around 45,000 in 2003. In India, they rose from 81,000 to 98,000 in the last five years alone. And road accident injuries shot up from 383,000 in 2003 to 447,000 in 2005. In Britain, a candidate’s driving skill isn’t sufficient to get him a licence. He must have practical knowledge of his car engine. An examiner asks him to check a car’s engine oil, the coolant and windscreen washer level, brake fluid reservoir, the state of the hand-brake, and even tyres for tread depth. The actual driving test lasts a tough 40 minutes in which a candidate has to reverse his vehicle around a corner and up the street along a kerb. If he touches the kerb, he flunks. If he reverses too far from the kerb, he flunks again. An average Briton gets a driving licence only after two-three attempts. The result is a long-time continuing decline in Britain’s road accident rate. India’s roads will also become safer if driving skills are tested by private sector auto companies. The companies don’t have to replace the government’s transport offices. They can be parallel service providers such as Jet Airways in the aviation sector or Bharti in telecom. The privatization doesn’t have to be done nation-wide. Even if it’s tried and tested in Delhi or Mumbai, it’ll make a huge difference because Delhi’s vehicle population (4.2 million) is six times that of Bihar (700,000). Any move to privatize the giving of driving licences will be stoutly resisted by politicians and officials. They fatten on their current monopoly. Issuing new driving licences and renewing old ones is a gigantic industry. India has 7.6 crore motorized vehicles and their number rises by 4 million a year. Government transport offices issued 4 million driving licences in fiscal 2001-02. To avoid standing in long queues, applicants pay anything from Rs200 to Rs2,000 to speed up their work. So, India’s 650-plus transport offices have an illegal turnover of a few hundred crore rupees, which is shared by politicians and government officials. Naturally, they will fight to retain this lucrative monopoly. There’s an irresistible argument for diluting this monopoly. The dilution will be a pro-poor measure. Road accidents in India don’t kill the affluent sitting inside cars. The accidents kill and injure middle-class and low-income pedestrians and two-wheeler riders. It’s these people whose lives will be saved when private-sector driving licence authorities start working with uncompromising integrity.